Check out the NewStreamlight Scene Light Rechargeable Lantern.Rapidly deployed and easily stowed, the Scene Light brings 3,600 lumens to your work area. With its narrow footprint and 72″ extension pole, this light goes almost anywhere, from wide open places to tight, confined spaces. The stowed size of this light makes it perfect for an array of emergency response scenarios, ranging from fires to accident investigations and everything in-between. The Scene Light has three operation settings, with a high output of 3600 Lumenswith a run time of 5 hours under full charge, the medium setting at 2400 Lumens for 9 hours, and a low setting at 1100 lumensfor 18 hours. You can also adjust the light beam width for an optional setting in any situation. Scene Light batteries will continue to charge while operating directly from an external 12V DC power source when using the remote cord. AC charger also included for continued use. For more information on pricing and availability of the Streamlight Portable Scene Light contact your local AAA Emergency sales representative or our White Plains Headquarters. The Scott Safety Air-Pak X3 SCBA was designed not only to exceed the new requirements outlined in the 2013 Edition of the NFPA 1981 and 1982 standards, but also to exceed customer expectations for what an Air-Pak SCBA should be. The Air-Pak X3 SCBA improves comfort through new shoulder strap designs, better weight management, and improved hose and wire management resulting in the cleanest Air-Pak SCBA on the market. Also introduced is the new “external” HUD and optimally positioned “buddy” lights. The Air-Pak X3 can be ordered with either a CGA cylinder connection or a Snap-Change cylinder connection. The Akron Brass 20,000 Lumen SceneStar™ LED Scene Light can provide you and your emergency personnel with the appropriate lighting to get the job done right. The scene lights are engineered to provide industry-leading levels of light output with consistency and reliability. The SceneStar™ Emergency Scene Light provides overall illumination (even at elevated operating temperatures) through optimized thermal management. The optics are designed to include a spot and flood pattern in one light. Solid-state electronics ensure a lifetime of peak performance. For more details, or to order a SceneStar™ or other Akron Brass products, contact our main office or your local sales representative. Scott Safety’s AV-3000 HT facepiece meets all requirements established in the NFPA 1981:2013 Edition standard, with state-of-the-art material technology to provide enhanced thermal durability and voice intelligibility performance for added safety. NFPA Approvals have come through, and the AV3000-HT is available today through AAA Emergency! Fire Research Corporation (FRC) manufactures high intensity scene lighting in several different styles of lampheads and fixtures. The SPECTRA LED lamphead puts out 20,000 lumens of super bright white light. Its design generates a uniform flood and spot combination light pattern. This unique light pattern provides enhanced work area visibility as well as illuminating objects at a farther distance. SPECTRA lampheads can be ordered in all FRC mounting configurations including, telescopic poles, tripods, non-telescopic mounts, flat surface mounts, and brow mounts. This is the perfect light for newly acquired emergency vehicles and upgrading lighting on your existing emergency vehicles. For more details on the SPECTRA or any other FRC products, contact our main office. Light up the night around you for safe and efficient emergency scene! The Industrial Scientific Tango TX1 in the first ever single gas monitor that uses two sensors to detect the same gas. The patent pending DualSense™ Technology makes users of the TX1 85 times safer. The unit offers a 3 year warranty from the original purchase date. Longer battery life is attained as the unit is capable of operating in the “always-on” mode for three years. After the battery can no longer support instrument life, it can be replaced for another three years of continuous operation. In addition, the Tango TX1 offers a louder instrument alarm with 100 db at 10 centimeters, making it twice as loud as the Industrial Scientific GasBadge series, and louder than another other single gas meter on the market. Available in CO, H2S, NO2, and SO2, the Tango TX1 is the next big thing in single gas detection! Check out our Online Store for pricing & availability. The RIT Safety Solutions Group Search Products are providing firefighters with the rights tools for effective, rapid, and safe large area search operations. Two of the RIT search products we would like to showcase include the Primary Search Lines and the RIT Group Serarch Kit. The Primary Search Lines are available in Chicago or Standard bag styles and are available in 100′ or 200′ lengths. The primary search lines are made up of 9.5mm Kevlar over polyester and two non-rated carabineers.Primary lines have the option of being equipped with the knot and ring marker system. The ring provides a secure fixed anchor for attaching tag lines. The knot indicates direction and distance to guide the searcher. Included in the bag, is 9.5mm Kevlar rope with a temperature rating of 862 degrees F. and a tensile strength of 7600 pounds. The RIT Safety Group Search Kit makes search operations more effective and safer for all personnel involved. The standard kit is set up for a four person team and provides a lifeline to the outside for each member. Each kit comes with either 100′ or 200′ of rope as detailed in the above Primary Search Line. Optional features like 25′ retractable tag lines set firefighters up for success during search operations. The self-retracting system ensures firefighters will not be tangled on their own life line during search and rescue operations. 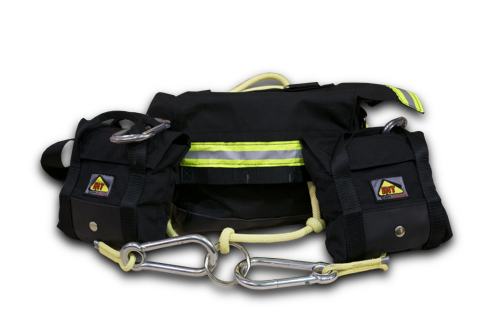 When this pouch is secured to a firefighters harness, ladder belt, or turnout gear, they can truly go hands free and utilize both hands for searching while maintaining an effective point of contact with the rest of the team. For more details on the RIT Group Search Products check out the RIT Website or contact your local sales representative. The Quick Step Anchor focuses on one major goal, making firefighting and roof operation safer. Designed and invented by Captain Robert S. Duffy of the Springfield, MA FD, the Quick Step Anchor not only maximizes safety, but also speeds up roof ventilation on the fireground. The Quick Step Anchor is a sturdy and robust roof step that will make your vertical ventilation operation faster and safer. In addition, the Quick Step Anchor folds to a compact piece of equipment which is easily stored on the truck. With the use of a safety lanyard, firefighters are able to safely and effectively carry this piece of equipment with them to the roof hands free. For more information please contact our main office or your local sales representative. In February Turtle Plastics introduced the newly designed Sandwich Wedge. Many rescuers prefer the feel of wood for rescue operations. Therefore, Turtle Plastics released this product to cater to their needs. This product combines the best of both worlds, by providing the industry leading plastic core with laminated wood surfaces where it counts. The cribbing wedge is available in a black or yellow plastic core and the laminate wood surface can be replaced with commonly available materials. For more details on these and other Turtle Plastics products contact your local sales representative or our White Plains office.